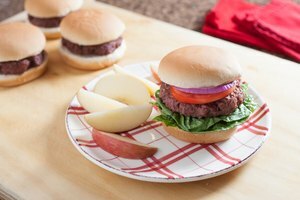 If you're looking for a fast, easy way to prepare flavorful hamburgers, look no further than the broiler function of your cooking range. Making burgers in the oven is more convenient than firing up the grill – especially if you don't own one or your yard's under a foot of snow – and it means less splattering oil and fewer calories than frying them on the stove top. Your burger broiling adventure begins long before you stick the patties in the oven. It starts with selecting the best ground beef for your purpose: ground chuck. This cut has the fat content you want – 15 to 20 percent – for lots of flavor and juiciness and to stand up to the high heat of broiling. If you can't get ground chuck, go with ground sirloin or ground round. 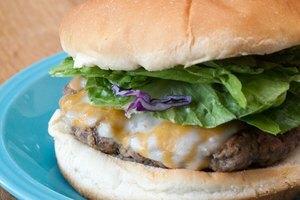 Ground sirloin is bursting with beefy flavor, but your burgers will probably be a little on the dry side. Conversely, ground round lacks flavor but cooks up moister than ground sirloin. 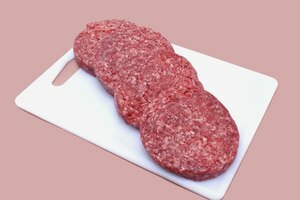 Add seasoning to the ground beef before forming hamburger patties. Break apart the meat and place it in a bowl. At minimum, add salt and pepper. There are plenty of other options, like garlic or onion powder, chili powder or red pepper flakes if you want some heat, mustard powder, basil, oregano, etc. If you wound up with less-flavorful ground round, be a little heavier handed with the herbs and spices, or use a few more. You can also add a splash or two of liquid flavor, like hot sauce, steak sauce or Worcestershire sauce. 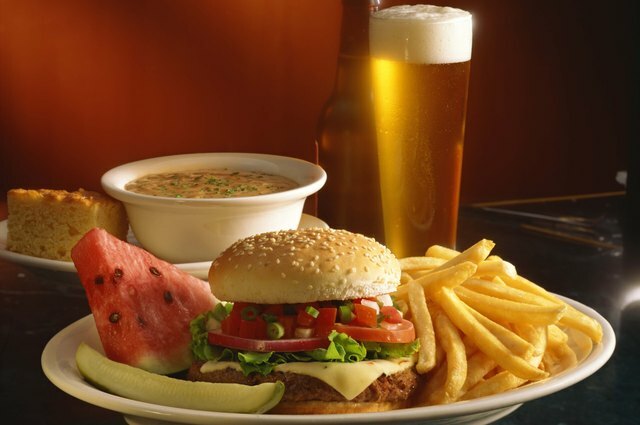 If you bought ground sirloin, which can turn out dry, a liquid seasoning can help produce moister broiled burgers. Minced garlic, onion and bell pepper work too if you want to go the extra mile. It's better if you give them a quick sauté to develop their flavors and let them cool before putting them into the raw ground beef, but it's not necessary. When you fold in the seasonings and shape the meat into patties, work the ground beef as little as possible and pack it as lightly as possible. The more you massage and squeeze and compact the meat, the more dense and chewy the burgers will turn out. Because the broiler uses relatively high heat, it's not hard to end up with an overcooked exterior before the burger cooks all the way through if the patties are thick. So, keep them to about 1/2 to 3/4 inches thick; about 4 inches is a good width. Burgers plump up when they cook. Press a few fingers into the middle of the top of each patty to create a shallow but wide dimple. The meat will expand there, yielding flat hamburgers rather than rounded ones. Heat the broiler. On most ovens, this just entails turning it on and waiting about 10 minutes. Some ovens have multiple broiler settings, in which case you should set yours to high. If your broiler is in a compartment below the oven, cover the rack with foil and lightly grease it. If the broiler is in the oven, position an oven rack to broil the burgers with their tops 3 to 4 inches below the broiler heating element. With these setups, you can broil hamburgers on various surfaces, like a broiler rack, baking tray or cast-iron skillet. Put the burgers in the oven directly beneath the broiler heating element, cooking them for about 2 to 3 minutes on each side. If you want to melt cheese on your burgers, put it on top for the final minute. Cooking times differ and are affected by all sorts of factors, like the oven's temperature, the thickness of the burgers, what you're cooking them on and so on. Use a meat thermometer to make sure the burgers reach 160 degrees Fahrenheit in the middle. Can You Broil Frozen Burger Patties?